You want summertime heat and humidity? You'll have it by midweek. After a wet and tumultuous weekend, I'm happy to report we have a much quieter forecast ahead. 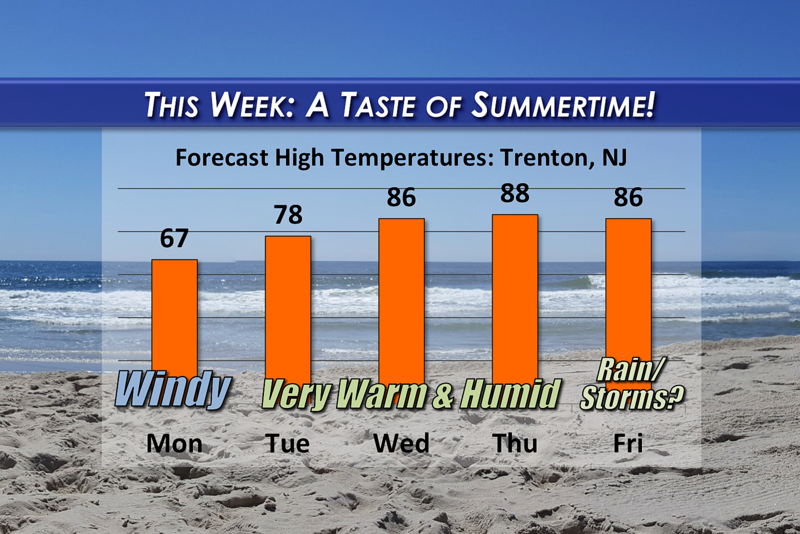 The big weather story of the week will be a big increase in temperatures and humidity, leading to a real taste of summer by Wednesday and Thursday (and probably Friday too). Stepping out the front door on Monday morning, you'll be greeted by seasonable, comfortable temperatures in the lower 50s. Meanwhile, a massive low-pressure system — the culprit for this weekend's stormy weather — is exiting New England and eastern Canada. There are a few final sprinkles and showers in northeastern Pennsylvania and the southern tier of New York. While models insist North Jersey will stay dry Monday, I wouldn't rule out a few raindrops early on. The northern third of the state will likely remain partly sunny throughout the day, while Central and South Jersey enjoy abundant sunshine. High temperatures will range from the lower 60s to the north, to the upper 60s to the south. As strong low pressure departs and high pressure arrives, the ensuing pressure gradient will create quite the weather nuisance on Monday: wind! Northwest winds will be sustained at 25 mph, with gusts to 35 or 40 mph. That will keep high temperatures from climbing out of the 60s Monday afternoon, just barely below mid-May normals. The fierce winds will calm significantly by Monday night. It should be a comfortable overnight, with clear skies and low temps dipping into the lower 50s. Our warming trend really kicks in Tuesday, as our wind shifts to a southwesterly direction. Abundant sunshine will push most high temperatures into the upper 70s. South Jersey may touch 80 degrees. The Jersey Shore will be cooler, closer to 70 degrees. Overall, a beautiful, warm Spring day. Wednesday gets even warmer, with inland highs in the lower to mid 80s. We'll add some noticeable stickiness to the air on Wednesday too, as humidity increases. Skies will feature scattered cloud cover, alongside occasional sunshine. It looks like Thursday will be the warmest hottest day of the week, as southern NJ makes a run for 90 degrees! Even the coast could see mid 80s on Thursday. This would be above normal even in the peak of summertime. Again, we'll see a mix of sun and clouds on Thursday. And I have to include a chance of a shower or thunderstorm &mdash. It's admittedly a slight chance, but given the extreme warmth and humidity any isolated storm that does form may be on the strong side. And unfortunately, after a wonderfully warm and delightfully dry week, the weekend turns downhill. Cooler temperatures and sporadic rain might make outdoor plans less than ideal. The weekend details admittedly remain low confidence at this time — we'll keep you posted as the forecast continues to evolve.